TITQ #35 - Patrick Marran - Hi, Patrick! Patrick Marran is an actor, musician, and arguably TITQ's biggest fan. And he's willing to fight to keep that title. He knows karate, Krav Maga, and we're definitely not just making up awesome facts about him now to get you to listen. Also he has a pet dragon. Check him out! New York City's 327th-Best Theatre Troupe. Performing the entire canon of William Shakespeare in chronological order. All the news that's fit to print (and more) about New York City's 367th-Best Shakespearean Theatre Troupe. At Hamlet Isn’t Dead, we know that shared emotional and intellectual experiences are vital to all people. As Shakespeare did, we provide an authentic sense of joy to every audience member, regardless of race, creed, religion, or financial situation. Our mission is to present the best theatrical experience possible, allowing you to witness and become a part of the sublime. 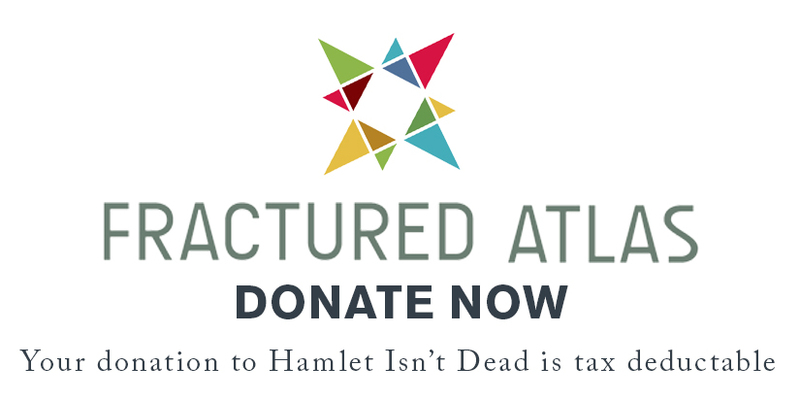 Hamlet Isn't Dead is fiscally sponsored by Fractured Atlas. All donations are tax-deductible.